Hope everyone has a wonderful and safe Thanksgiving! The NSP is designed similarly to the VT Community Development Program, but with a little bit more flexibility. Towns will be able to apply for funds to purchase foreclosed housing units, blighted units, or vacant units that are in foreclosure, but not yet foreclosed. There will be funds for administration of the grant and for writing the grant application. Grant applications won’t be available until February 2009 which is when the Department of Housing and Community Affairs expects to have a grant agreement from HUD. There will be 3 pieces to this $19.6 million grant: $8 million for VHFA to expand on their housing ownership program; $4.82 million for municipal programs to purchase, rehabilitate where needed, and sell foreclosed housing units both single family and multiple units; and $4.82 million for project specific programs whereby for-profit and not-for-profit entities can apply for up to $1 million to purchase, rehab, and sell foreclosed housing units of 4 units or more per structure. The NSP program requires a quick turn around; funds must be obligated in 18 months (August 2010). However, it should be noted that these funds are NOT for foreclosure prevention, but only for housing already foreclosed upon. The eligible beneficiaries must be of low, moderate, or middle income (no more than 120% of median area income) and are the families moving in; not the families moving out because of the foreclosure. As more news develops, we will keep you posted! The Town and Village of Waterbury have received a planning grant from the Vermont Community Development Program to explore the feasibility of sites for economic development and affordable housing in and nearby our designated downtown. The project will examine specific sites, the surrounding areas, and the associated public infrastructure needs, as well as economic models that could be used to accomplish the various projects. We are seeking a consultant team including the professional disciplines of architecture, civil engineering, structural engineering, landscape architecture, planning, economic analysis, and public participation facilitation. The deadline for submitting proposals is Wednesday, December 3, 2008 at 12:00 noon. If you have any questions regarding this exciting project please e-mail Steve Lotspeich at slotspeich@waterburyvt.com or call (802) 244-1012. The State of Vermont Agency of Commerce and Community Development, Department of Housing and Community Affairs is seeking public comment prior to submission to HUD on the substantial amendment to the Consolidated Plan that governs the use of Community Development Block Grant (CDBG) Program, the Home Investment Partnerships Program (HOME), the Emergency Shelter Grant Program (ESG), and other HUD programs. The substantial amendment is to manage the new Neighborhood Stabilization Program (NSP) in the amount of $19.6 million as authorized by the recently enacted Housing and Economic Recovery Act of 2008. The NSP is to assist states and local governments in addressing the effects of abandoned and foreclosed residential properties through eligible activities. Please go to www.hud.gov/offices/cpd/communitydevelopment/programs/neighborhoodspg/nspnotice.pdf for more information on the Act. The Draft NSP application to HUD and amendment to the Consolidated Plan will be available on the Department website as of November 10, 2008 at www.dhca.state.vt.us/vcdp, or at the Agency offices at One National Life Drive, North Lobby, Sixth Floor; Montpelier, Vermont. Written comments will be accepted through November 25, 2008 and should be sent via e-mail to Cathy.Scott@state.vt.us. Only if unable to e-mail send comments addressed to Agency of Commerce and Community Development; 1 National Life Drive; Montpelier, VT 05620-0501. 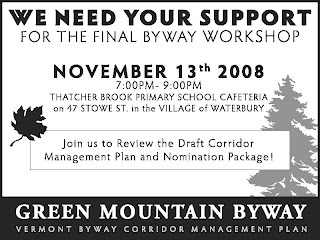 The public hearing will be held on November 12, 2008 at 5:00pm – 6:30pm at the Pavilion Auditorium, 109 State Street; Montpelier, Vermont. The meeting room is fully accessible. Accommodations for persons with disabilities will be made upon request. Interpreters to meet the needs of non-english speaking persons will be made upon request. Requests should be made to Cathy Scott at (802) 828-5221. TTY#1-800-253-0191. The UVM Extension Service and the VT Energy and Climate Action Network (VECAN) are sponsoring an energy conference on Saturday, December 6, 9 a.m. to 4 p.m. at VT Technical College in Randolph. Workshop topics include: initiatives on energy and climate action, energy planning at the local and regional levels, promoting alternative transit, biomass heating, State-level energy policies, creative community campaigns to reduce energy use, community-sponsored renewable energy projects, building an effective town energy committee, tools and approaches to reducing energy use in town buildings, and more. The keynote speaker will be Glen Brand, co-founder and director of the Sierra Club’s Cool Cities Program. Registration is $20 per person and includes all workshops, general sessions, exhibit hall, and lunch. To register: go online to www.regonline.com/VTEnergy, call Mary Peabody at UVM Extension Service 802/223-2389, or email Mary at mary.peabody@uvm.edu. The Vermont Department of Fish and Wildlife has published a manual called “The Place You Call Home: A Guide to Caring for Your Land in Vermont.” It is aimed at offering best-practices information on the flora and fauna of Vermont to educate landowners in being stewards of the land. The Guide is available upon request at 1-800-290-5232. Is anyone a teacher? This would be a great Guide to use with students.